RWC5010A_NFC Tester is a test equipment to test and validate NFC Devices. It provides various kinds of functions such as power vs. time measurement, link analyzer and modulation characteristic and load modulation measurements. 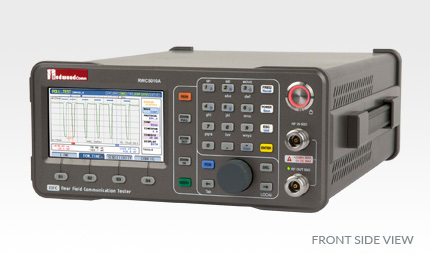 RWC5010A is a compact low-cost all-in-one tester which includes Protocol Emulator, Power Amplifier, Oscilloscope, Voltmeter and software for tests and measurements. RWC5010A provides logging and analysis functions of link messages between the Tester and a Listening Device Under Test (DUT). In addition, all link timing values are measured and recorded in real-time during communication such as Guard Time (GT), and Frame Delay Time (FDT) or TR0 depending on the type of NFC protocol. Power vs. Time measurement is provided with graphical display window, similar to an oscilloscope function, which includes markers, delta marker, zoom-in/out, and so on. It automatically measures and displays the load modulation amplitude of a Listening DUT. Receiver Sensitivity Test validates the responsiveness of a Listening DUT with user-configurable VDC level. Three operating modes are provided: ‘SEARCH’ finds automatically the resultant sensitivity level at which DUT responds, ‘VDC’ sweeps fully VDC values within the defined range, and ‘TIME’ monitors link quality with fixed conditions. Especially in case of Listening DUT it is required frequently to check its resonance frequency during development and test. 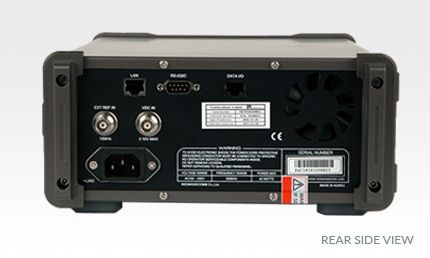 RWC5010A provide a special function to measure the resonance frequency in a way similar to S11 measurement of network analyzers. RWC5010A operates as a role of the reference Listening Device, sending the corresponding responses to commands of a Polling DUT. NFC protocol parameters of Listening Device can be configured in ‘CONFIG’ screen as for users’ test purposes. Pow-Time in POLL Test may be used mainly for measurement of modulation characteristics of a Polling DUT. It automatically captures a target command signal of DUT and then measures the modulation parameters. Modulation characteristic measurement results are reported automatically on the screen, which include rise time, fall time, bit duration, overshoot (undershoot), modulation index, and so on. The upper/lower limits for each are also automatically calculated according to NFC Forum Analog Specification. To validate the receiver sensitivity of a Polling DUT, the Tester provides setups for load modulation amplitude in the range of limits as specified in the NFC Forum Analog Specification. Three operating modes are also provided and various test conditions can be set up as explained in LISTEN Test. RWC5010A provides logging and analysis functions of link messages between a Listening DUT and a Polling DUT, or between two NFC devices by ‘sniffing’. In this mode, the Tester enables only its receiver to capture all messages between them. This feature may be useful in checking the interoperability among various types of NFC devices. Pow-Time in SNIFF Mode may be used for measurement of modulation characteristics of a Polling Device or link timings between two NFC devices. It automatically captures a target command signal of DUT and then measures the modulation parameters.